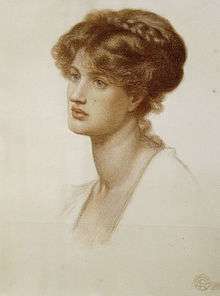 Marie Spartali Stillman in 1868. Photograph by Julia Margaret Cameron. Marie Euphrosyne Spartali (Greek: Μαρία Ευφροσύνη Σπαρτάλη), later Stillman (10 March 1844 – 6 March 1927), was a British Pre-Raphaelite painter of Greek descent, arguably the greatest female artist of that movement. During a sixty-year career, she produced over one hundred works, contributing regularly to exhibitions in Great Britain and the United States. Maria Spartali was the eldest daughter  of Michael Spartali (1818–1914), a wealthy merchant, principal of the firm Spartali & Co and Greek consul-general based in London from 1866 to 1882. He had moved to London around 1828. In London he married Euphrosyne (known as Effie, née Varsami, 1842–1913), the daughter of a Greek merchant from Genoa. The family lived in their Georgian country house with a marble-pillared circular hallway, on Clapham Common, known as 'The Shrubbery' with a huge garden and views over the Thames and Chelsea. In the summer months, they moved to their country house on the Isle of Wight where her father developed the cultivation of grapes on his lands. In London, her father was fond of lavish garden parties where he invited up and coming young writers and artists of his day. She and her cousins Maria Zambaco and Aglaia Coronio were known collectively among friends as "the Three Graces", after the Charites of Greek mythology (Aglaia, Euphrosyne and Thalia), as all three were noted beauties of Greek heritage. It was in the house of the Greek businessman A.C. Ionides (1810–1890) at Tulse Hill, in south London, that Marie and her sister Christine (1846–1884) met Whistler and Swinburne for the first time. They were dressed in white with blue ribbon sashes. Swinburne was so overcome that he said of Spartali: "She is so beautiful that I want to sit down and cry". Marie was an imposing figure, around 1.9 meters tall and, in her later years, dressed in long flowing black garments with a lace hood, attracting much attention throughout her life. Spartali studied under Ford Madox Brown for several years from 1864, with his children Lucy, Catherine and Oliver. Rossetti, on hearing that she was to become a pupil to Madox Brown, wrote to him (on 29 April 1864), "I just hear Miss Spartali is to be your pupil. I hear too that she is one and the same with a marvellous beauty of whom I have heard much talk. So box her up and don't let fellows see her, as I mean to have first shy at her in the way of sitting." She first sat for him in 1867. He wrote to Jane Morris on 14 August, "I find her head the most difficult I ever drew. It depends not so much on real form as on a subtle charm of life which one cannot recreate." She was the most intellectual of his models. She modelled for: Brown; Burne-Jones (The Mill); Julia Margaret Cameron; Rossetti (A Vision of Fiammetta, Dante's Dream, The Bower Meadow); and Spencer Stanhope. A Rose from Armida's Garden (1894) by Marie Spartali Stillman. In 1871, against her parents' wishes, she married American journalist and painter William J. Stillman. She was his second wife, his first having committed suicide two years before. The couple had posed for Rossetti in his famous Dante pictures, though it is not certain if that is how they first met. He first worked for the American Art Magazine, The Crayon. His later job was a foreign correspondent for The Times. His job as a foreign correspondent resulted in the couple dividing their time between London and Florence from 1878 to 1883, and then Rome from 1889 to 1896. She also travelled to America, and was the only Britain-based Pre-Raphaelite artist to work in the United States. She had three children. Marie Spartali died in March 1927 in Ashburn Place in (South Kensington). Marie was cremated at Brookwood Cemetery, near Woking, Surrey, and is interred there with her husband. The grave is marked by a simple lawn headstone. Her last will and testament contains a letter where Marie wrote, "It seems rather absurd to make a will when one has neither possessions nor money to leave". She left various personal items, including some mementos from her life as an artist. The subjects of her paintings were typical of the Pre-Raphaelites: female figures; scenes from Shakespeare, Petrarch, Dante and Boccaccio; also Italian landscapes. She exhibited at the Dudley Gallery, then at the Grosvenor Gallery and its successor, the New Gallery; at the Royal Academy; and at various galleries in the eastern USA, including the Centennial Exhibition in Philadelphia in 1876. A retrospective show of her work took place in the United States in 1982, and another one at the Delaware Art Museum in 2015. The latter show transferred to the UK in 2016, opening at the Watts Gallery at Compton near Guildford in Surrey on 1st March 2016 until 5th June 2016. David Elliott lists more than 170 works in his book. The following are the better-known works, as determined by their mention in other books which discuss the artist. Elliot, David B. (2005). A Pre-Raphaelite Marriage: The Lives and Works of Marie Spartali Stillman and William James Stillman. Woodbridge, Suffolk: Antique Collectors' Club. ISBN 1-85149-495-2. Dyson, Stephen L. (2014). The LAST AMATEUR The Life of William J. Stillman. New York: State University of New York. ISBN 978-1-4384-5261-6. Marsh, Jan; Pamela Gerrish Nunn (1998). 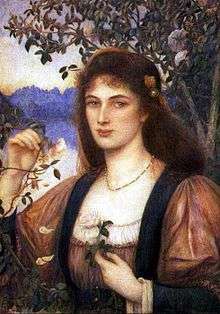 Pre-Raphaelite Women Artists. London: Thames and Hudson. pp. 131–135. ISBN 0-500-28104-1. Stillman, William James (1901). Autobiography of a Journalist. London: Grant Richards. 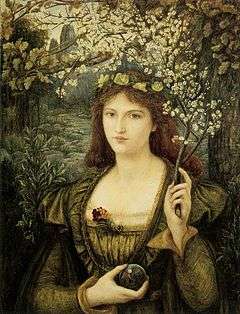 ↑ "Poetry in beauty: The pre-raphaelite art of Marie Spartali Stillman". ↑ Collins, Maxine (9 November 2015). 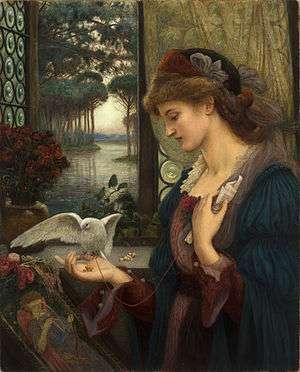 "Marie Spartali Stillman: The female artist time forgot". BBC. Retrieved 10 November 2015. ↑ "Marie Spartali Stillman: The Enchanted Garden of Messer Ansaldo". ArtMagick.